Okanagan Falls, Okanagan Valley, British Columbia, CanadaThe gentle, minimal intervention style at Meyer filters all the way down to the introductory pinot simply labelled ‘Meyer’. It bears an Okanagan Valley designation and blends fruit from the home property Mclean Creek Road Vineyard in Okanagan Falls, Reimer Vineyard in South East Kelowna and two East Kelowna sites. Destemmed and cold soaked it undergoes a long fairly warm fermentation. It is all hand plunged and post maceration it spends ten months in 100% older seasoned French oak barrels. 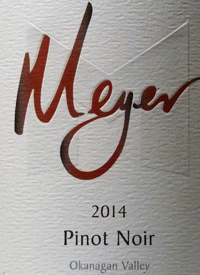 Certainly the ripest OK pinot we have tasted from Meyer, but what makes this better than past years is the juicy character of the wine. Cran-cherries, rhubarb, raspberry fruit covers the palate with that silky mouth-filling pinot texture. Fine quality and style and perfect with chicken or duck and or mushroom dishes. Good value. A mix of California and New Zealand meets BC.Tasted: 05 August 2016Tasted by: Anthony GismondiPrices: BC	25.00	winery direct, vqa, private retail Producer: Meyer Family VineyardsDistributors: International Cellars Inc.